This entry was posted on February 11, 2014 by Jessica Anderson. What is the ARA and why are we members? What are the benefits? And why should it matter to our customers? I hope to answer these questions and more! 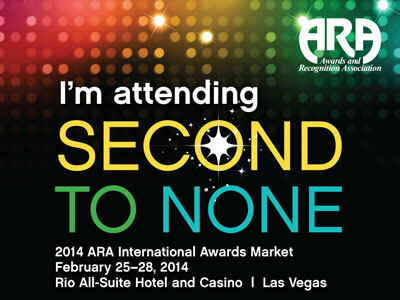 The 2014 ARA Trade Show in Las Vegas is at the end of the month. 2. Manufacturers and suppliers that provide products, technology and equipment to awards retailers. 3. Many companies with a common purpose: to promote the public awareness of the use and benefits of quality recognition products and to educate its members in the areas of business skills and ethics, technical competence, product knowledge and marketing. The ARA publishes a monthly newsletter, called the 'Recognition Review', has an informative and helpful website, provides technical training, and has a ‘Member to Member’ forum where awards business owners across the country can connect and share information. The ARA also advocates for the awards industry as a whole. 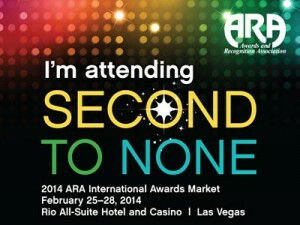 But the biggest advantage to membership is free attendance to the annual ARA International Awards Market in Las Vegas. Jeff, Tom, Laurie and I are headed to this event at the end of the month. 1. New products. We make a list of product lines that need refreshing, along with engraving equipment or parts that need replacing. Then we scout exhibits looking for new items that fill these needs. For example, this year we will be looking for custom awards, medals, and gift items. 2. Networking with our suppliers. Most of our vendors attend the show. We enjoy building relationships with them by meeting them face-to-face. 3. Meeting other business owners. Many awards retailers share ideas and help each other in their businesses. Even though we are competitors, our philosophy is sharing ideas to boost the industry as a whole helps us all. 4. Recognition the ARA gives to its members. Many industry awards are distributed at the trade show, and it’s an honor to receive recognition from our peers. In 2010, Trophies2Go received the ARA ‘Website of the Year’, and in 2012 received the ‘Large Retailer of the Year’ award. The ARA also gives college scholarships to high school seniors students across the country through their ARIEF Scholarship Program.